Post your help wanted or job wanted ad here, and let the community help. Welcome to Spidell’s Job Posting Board, where we connect opportunity with availability! Whether you are an employer with a position to fill or are searching for your dream job, this free service is available to help you navigate the job market. Just follow these few simple steps to post your information on the board: E-mail jobboard@spidell.com with your name, city, and contact information. If you’re an employer, provide an accurate job description (limited to 600 characters); and if you’re a job seeker, highlight your experience and specific skills (600 characters or less, please). Your posting will stay active for 30 days and can be renewed at your request. Looking for the opportunity to put your skills to good use, or longing for a short commute? Check out these job openings, and revisit this page often for new postings. A small accounting office in Encino 91316 is looking for a licensed tax preparer (CPA/EA or on track to get a license) permanent part-time, may become full time. It’s not an entry level position. Duties include posting adjusting journal entries, individual and business income tax return preparation. We use UltraTax and QuickBooks. Please email your résumé to: elena@matsvaycpa.com. We are seeking a seasoned tax accountant for our 15-person accounting firm. We provide high level tax preparation and planning services to private companies and individuals. Please submit your résumé and cover letter to taxprofessional@meeposcpa.com. CPA firm seeking a seasonal tax preparer for 2019. 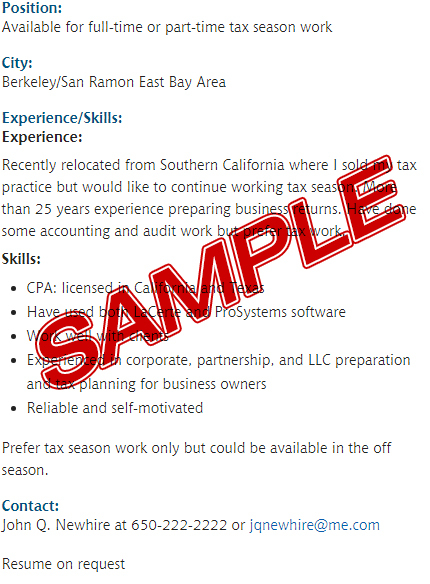 Candidate should be a CPA or EA, though not required, and have 3+ years recent experience with individual tax preparation. Trust and business tax preparation experience is a plus. Experience with Lacerte software is desired, but not required. Hours and schedule can be flexible. This position could lead to permanent full-time. Fast paced Tax Office seeking a Tax Professional to review Individual and Business Tax Returns during the 2019 tax season through May of 2019. Hours and schedule can be flexible. Candidate should be an EA or CTEC with 3 years recent experience and familiar with Lacerte software. Please submit your résumé to Admin@Bermfin.com. Looking for Part or Full Time. CTEC & IRS (AFSP) registered. 14 years in development and support for professional tax software products. Skilled at client interviews and return reviews. Robin L. Rehmet at r24eldo@gmail.com. Please include “Spidell’s Job Board” in the subject line.